Can you recall a favourite book from childhood and why it was enjoyable? 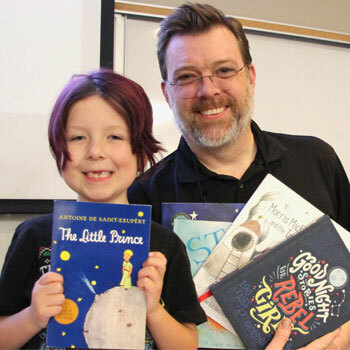 An initiative spearheaded by Wilfrid Laurier University Assistant Professor Michael Ackerman is bridging the age gap in understanding why kids enjoy or don’t enjoy children’s literature by bringing school-aged book reviewers to the university to share their critiques. This fall, as part of the Laurier Young Readers Initiative, Ackerman invited five children ranging from six to 11 years old to present a selected book and discuss why they liked or didn’t like it with his children’s literature class on Laurier’s Brantford campus. The university students then had the opportunity to ask questions. “It gets our students to think about the demographic that children's literature is written for and consumed by – children. That's different than how reading is done in class,” said Ackerman. Ackerman says it is also a benefit for the children, allowing them to experience a post-secondary environment in a way that is not intimidating, and encourages life-long learning. “This is a way to show them that they are valued, and that their perspective is important, even at that age,” said Ackerman. Six-year-old Arbor Doucette reviewed five books, including Morris Micklewhite and the Tangerine Dress, How to Catch a Star, and The Little Prince, in Ackerman’s class on Nov. 14. When asked about her reading habits, Doucette said she has been reading “for a long time” and described how she is teaching other people in her class to read. The hardest book she has read? Harry Potter and the Philosopher Stone. Other lectures included Jedi Academy: The Phantom Bully reviewed by Aidan Darling, The Hunger Games reviewed by Noah Topper, Thelma the Unicorn reviewed by Ella Topper and Charlie and the Chocolate Factory reviewed by Hayley Drewery. The idea of talking with children about children’s books grew from Ackerman’s past intergenerational initiatives where students worked with local seniors to produce collaborative autobiographical projects. Now on the opposite end of the age spectrum, Ackerman allows the university students to hear new perspectives from a younger generation. The collaboration with Sarah Darling, Laurier’s community service-learning coordinator, and Karley Doucette, writing and learning support coordinator, is another example of how Laurier faculty and staff are working together to provide creative and engaging learning opportunities for students in the Faculty of Liberal Arts.